Paper that reacts like incense. Famous throughout Europe, these amazing papers, called carta d’Armenia are exactly as they were in the 16th century. Fibrous looking papers with resinous scents of frankincense and myrrh. Folded into a fan-like shape and carefully lit the slip of paper unfolds into wisps of sweetly scented smoke like a concertina releasing perfumed notes . Smoldering little strips of paper with a breath from the Renaissance. 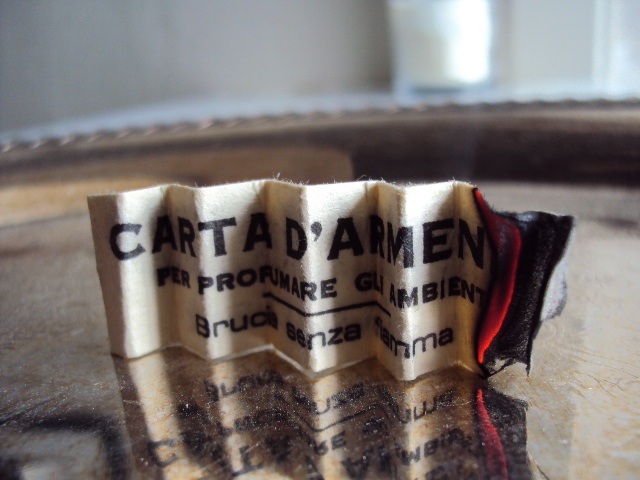 My carta d’ Armenia burning papers are from Santa Maria Novella Farmacia in Florence. A fragrant universe filled with terra-cotta jars and gilded urns that was already well-known in Dante’s time. A weary traveler could benefit from knowing about the ancient workshops and antica farmacia (pharmacies) where burning papers with healing ingredients create an Italian sense of benessere. They can be found all over Italy if you know where to look. The spirit of the Nobel Prize is innovation, research and transformation. Taking an idea from academia to involvement to change. Physics, chemistry, medicine, literature, economics , peace. Areas of achievement given honors in Stockholm this past December 10th at the 2013 Nobel Laureates award ceremony. 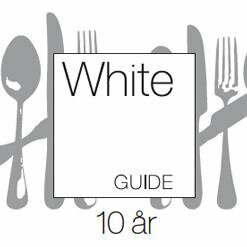 On March 3rd in Stockholm another honor will be bestowed, the White Guide Global Gastronomy Award 2014. 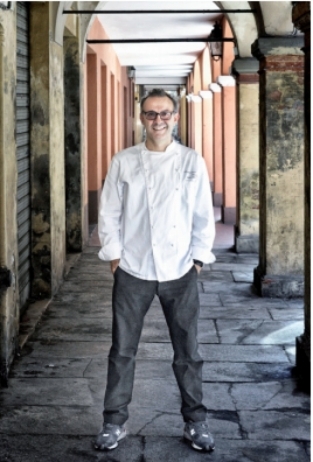 Chef Massimo Bottura of Modena will receive recognition for his dedication to one of the world’s most beloved cuisines (Italian), “elevating it to new amplitudes for senses and minds to explore and enjoy”. The award is being called the Nobel prize of Gastronomy and rightly so. The science of gastronomy (the study of food and culture) lends itself to to the spirit of the Nobel Prize blending art, technology, innovation and expression to transform the way we think about and appreciate food. At Osteria Francescana, Bottura’s 3 star Michelin restaurant in Modena, the memories of traditional Italian food are “brought out of the past into the future”. Bottura works under the assumption that “food is not only about the quality of the ingredients but the quality of the ideas”. Innovation, research, transformation – a nobel and award winning way to think about food. Although Martedi Grasso (Fat Tuesday) is a few weeks away Carnevale in the seaside town of Viareggio begins February 16th. A spectacular parade of floats that delight and amaze promenade the Lungomare for 16 days of revelry along the Versilia Riviera. 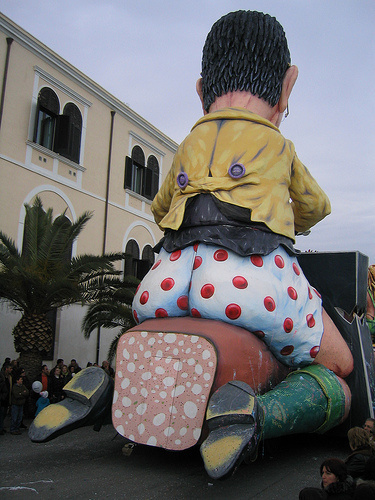 Second only to Carnevale in Venice, Carnevale in Viareggio is known for elaborate floats with huge papier-mâché figures, often caricatures of political, show business and historical figures. Floats can take a whole year to build created by master craftsmen and artisans known as carristi. Internal animations move the towering characters making them come to life as they navigate through clouds of streamers and coriandoli (confetti) creating a surrealistic pageant of satire and whimsy where anything goes at least for now. Italians do not celebrate Valentine’s Day as a one day merchandising campaign because love is in the air all year long in Italy and has been for centuries. While we were busy developing the austere virtues of the Reformation, the Italians were relaxing in the inspiring glow of the Renaissance. And although we might want to identify the Italian style of love differently, Italians more often equate love with the concept of enchantment, charm or delight, innamorato. Italians have been studying the concept of love for a longer time and in much more detail than we have. During the 12th century Andreas Capellanus wrote The Art of Courtly Love as a manual on how to conduct oneself in matters of the heart. 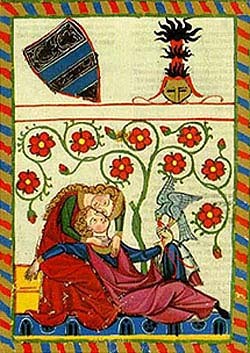 Scholars have tried to analyze it as a treatise of Medieval thought, a handbook for the would be Lancelot or a political parody of love in the courts of the nobility. 1.Marriage is no excuse for not loving. He poses and answers questions such as What is the Effect of Love ? and the answer he advises is a generosity of spirit that we can benefit from even today – Oh, what a marvelous thing is love, which makes a man shine with so many virtues and which teaches everyone to abound in good customs. In Italy the beginning of February has nothing to do with groundhogs and shadows but rather with a cake-like bread, the blessing of throats and celebrating woolen blankets. These disparate, seemly unlike, items and events do have a common denominator in Italy and his name is San Biago. 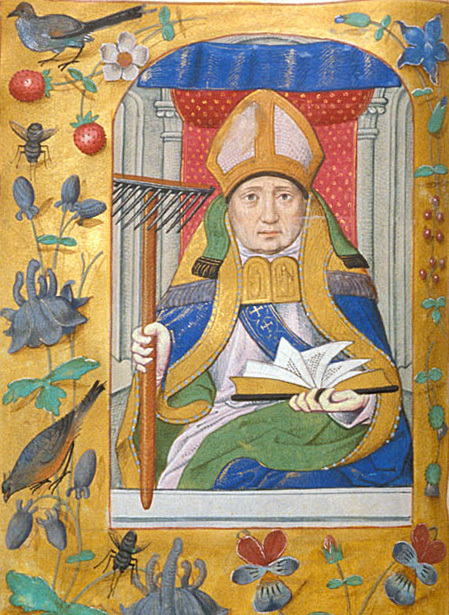 San Biago or St. Blaise, like St. Nicholas, was one of those saints who accumulated the legends and lore of folk customs for a variety of reasons. Best known as the saint protector of the throat since he once saved a child from choking, San Biago is also the patron saint of shepherds and the woolen industry because he was allegedly martyred on a prickly stone table used for combing out wool. 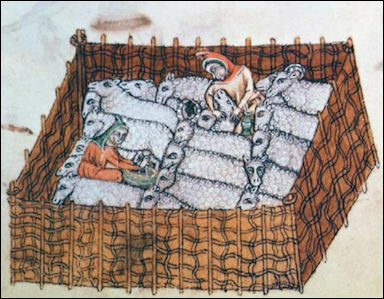 His feast day, February 3rd, is especially celebrated in Italian towns and European villages where wool was worked. Coincidentally February 3rd is also the last “best buy date” for a Milanese panettone baked over the Christmas holidays. The citizens of Milan ( where a statue of the Saint sits atop a spire of their Duomo) save their last piece of panettone to eat that day to commemorate San Biago and a legend. Just before Christmas a woman went to have her panettone blessed by the village priest who could not bless the bread at the time. Leaving the bread, the priest thought that the woman had forgotten about it so he ate it himself. However she returned on the feast of San Biagio. To the priest’s great surprise, San Biago had interceded and the relieved priest found a whole panettone twice the size of the one left by the woman. Today I’ll be eating my last slice of panettone under a warm woolen blanket invoking San Biago to protect me from the illnesses of winter. I never seem to have the willpower to save my panettone so this year I bought two, one to eat and one to use in place of the flu shot I never got. Grazie San Biago.